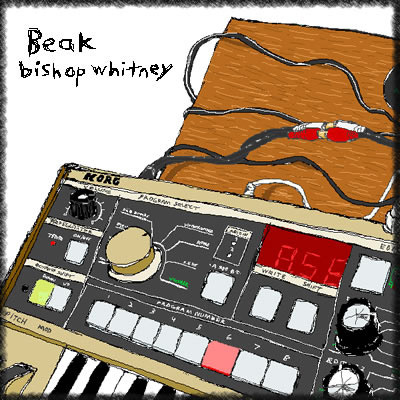 The latest release for guitar and beat-strewn idm artist Beak on Monotonik, following the ‘Amoral Mayor Earwig EP’ back in 2004 and ‘El Hacedor EP’ in 2005, the ‘Bishop Whitney EP’ continues his extremely unique mix of strongly played guitar, acoustic noises and cut-up percussion in fine, fine style. This time, we start out with the characteristic plucked freneticism of ‘Context Clues’, before seguing into the languid crawl of ‘Teach Texas Manner’, further showcasing his totally individual, beautiful melodic stylings. ‘Buggy Ride’ almost sounds indie pop to start out, before layering delicate melodies on top of the plucking. We finish out with the extended drawl of ‘Cakes’, all waiting for the sun to rise, and the downright funk of ‘Essines’ Hair’, bopping around like a crazy man, and we come to the conclusion that the unique guitar funk of Beak should never be forgot, at least not in this house.